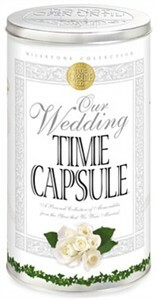 This Wedding Time Capsule is the perfect way to save your memories! Newlyweds fill the Wedding Time Capsule with memorabilia from the day and year of their marriage. This timeless keepsake is then sealed and not opened until a special anniversary years in the future. This heartwarming 21-piece gift set comes with everything needed to create an absolutely unforgettable treasure. This wedding time capsule usually leaves the warehouse in 1 business day.